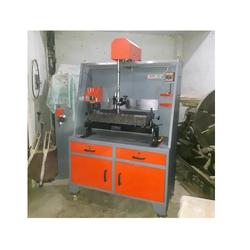 Master industries is a leading Manufacturer and Exporter of Valve Seat Cutting Machines that are made from high-quality steel. It has a long life and a shiny body because of the use of powder coating. The tooling system of the machine is made as per the NEWEN/ SUNNEN/ SERDI. This equipment is provided with 3 angles that makes it highly efficient. Also, it is equipped with pocket counter boring, cutting depth control with precision vernier and hence there is no need for the air connection. The counter weight, cutter assembly plate allows its easy mobility. Looking for Seat Cutting Machines ?